Lawn jockeys are stolen on the weekend, when tourists are over-served on Caroline Street or college kids are bored by living within the law. This was the case of the valuable bronze statue that was taken from the front porch of the Chestnut Tree Inn. It disappeared on a Saturday night and hasn’t been found since. John Behrendt, an owner of New York-breds, had a lawn jockey taken from his Phila Street front steps last summer, and he’s convinced that it’s sitting in a dorm room now. Behrendt, with some naiveté, put up a sign asking the thieves to return the stolen piece in exchange for “no questions asked.” No questions were ever asked. The lawn jockey’s still missing. Back in the day, as the suspected perpetrators might say, horse racing’s first families had their lawn jockeys painted in the colors of their silks, displayed the statues in front of their residences, and considered this one of two methods by which friends could find them. Summer-only residents also had their addresses identified in the “Cottage List,” which appeared in the local newspaper during the first week of the summer meet. Jeannette Jordan, who continues to cover the social scene for The Saratogian, provided this handy service for interested parties (and jewel thieves) as recently as the late 1970s. So, for example, we know that Alfred Gwynn Vanderbilt took up summer residence at 33 Fifth Avenue and Dell Hancock and Helen Alexander at 294 Lake Street. On the 27th day of Saratoga 2008, Ginger Punch won the $400,000 Personal Ensign Stakes (gr. I) by a nose over Lemon Drop Mom. In the silly seventh, another blockbuster superfecta was paid out. With two horses dumping their riders, Quick Comeback keyed a 9-6-5-10 that was worth $92,778.00.for a $2 wager. Channing Hill, who is known for falling off horses, was not one of the jockeys to get dusted. To his credit, he did, however, celebrate his 21st birthday in the winner’s circle atop Critical Cathy in the sixth. Speaking of lawn jockeys, one of the best riders on the grass – Ramon Dominguez – rode Sunshine for Life to victory in the Harry “the Horse” Copelan purse, aka the eighth. The secret Mohican Society of the brothers Devlin – Michael, Bob, John and Billy - took a silver cup into the winner’s circle as a prop for the photo. By the way, Bob Devlin has a lawn jockey in front of his Saratoga home. The statue is decorated in soft blue and green shamrocks and has the word “Curragh” inscribed on the base. In Gaelic, the Curragh represents sacred ground. 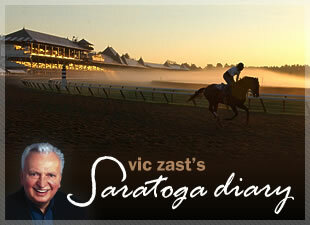 In the same sense, Saratoga Racecourse is the cathedral of racetracks.